Along with a pair of teaser trailers released last week for Toy Story 4, Tim Allen and Tom Hanks have been chatting about the emotional ending of the film that left them choked up during recent interviews. While Tim Allen was a guest on The Tonight Show with Jimmy Fallon last night (Nov 21), he reiterated the emotional ending while also revealing that Keanu Reeves was going to voice a character in the film. Watch the video embedded below of his interview discussing the film and how Keanu's character sounds a lot like Buzz Lightyear as well. Tim says (starting at 1:14 into the clip) — "Keanu Reeves has got a great part in it — actually, a little inside story, even he said...the gentle wonderful guy that he is...'this sounds too much like Buzz Lightyear.' And his character does have an edge to that and the guys [Pixar employees] said, 'so we've calmed him down a little bit' and they reminded me that his toy is only this big [mimicing a tiny figure about 2-3 inches tall]." What do you think about the addition of Keanu to the cast of Toy Story 4? Leave a comment below or chat about it with other fans in the Pixar Post Forum. 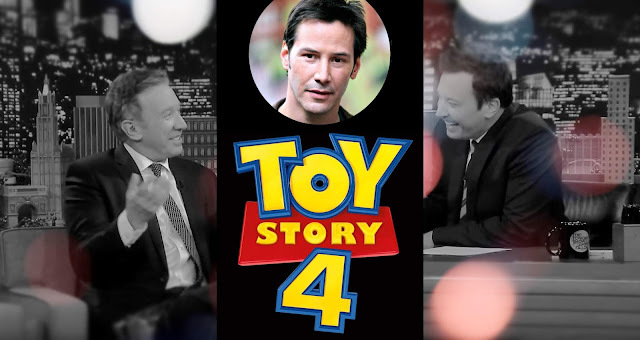 Tim Allen revealed on a recent episode of The Tonight Show with Jimmy Fallon that Keanu Reeves would voice an action figure in Toy Story 4.